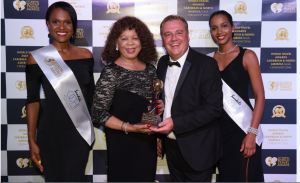 The picturesque Montego Bay Convention Centre copped its sixth consecutive World Travel Award for the esteemed ‘Caribbean’s Leading Meeting and Conference Centre’ category. The prestigious awards ceremony was held at Sandals Ochi Beach Resort last Saturday. “We have built an impressive brand that has international appeal and what we offer in terms of space, flexibility and service is unparalleled within the Caribbean,” Guise added further. She noted that the significance of the award is further heightened as the centre is enjoying a tremendous year. The centre recently hosted the 46th Annual Board of Governor’s Meeting for the Caribbean Development Bank and is slated to host Foromic 2016 in October a first for Jamaica. “There is always something happening at the Montego Bay Convention Centre,” Guise gushed. The World Travel Awards was mandated to acknowledge, reward and celebrate entities dedicated to excellence in all sectors of the global travel and tourism industry. The governing body is headquartered in London and was founded in 1993. Nominees are adjudicated by an international jury of hospitality experts and peers, with awards given both on world and international region levels in a wide range of categories.